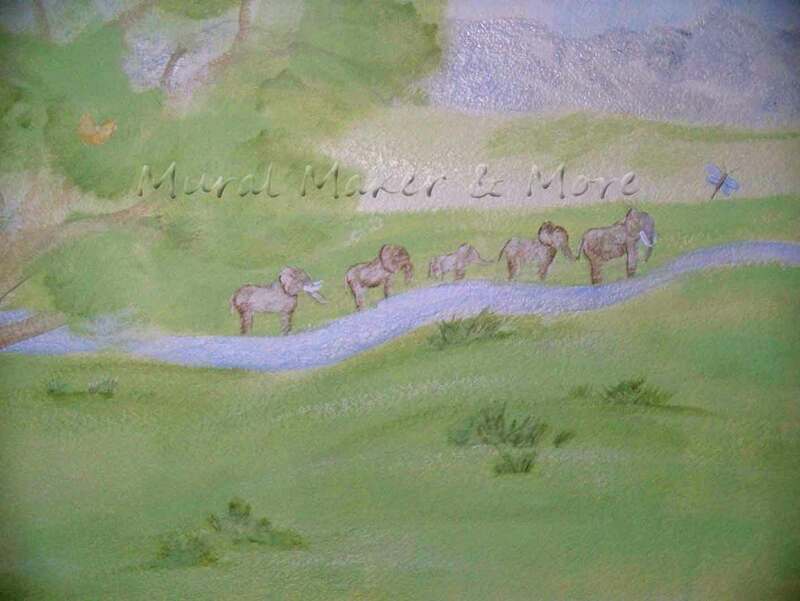 I took some new pictures of this Safari mural Tuesday when we did the live shot for Good Day Sacramento. The last time I took pictures was over 2 years ago, before the baby was born, and there wasn’t any furniture in the room. The day bed is so cute, under the gorillas and lion family. 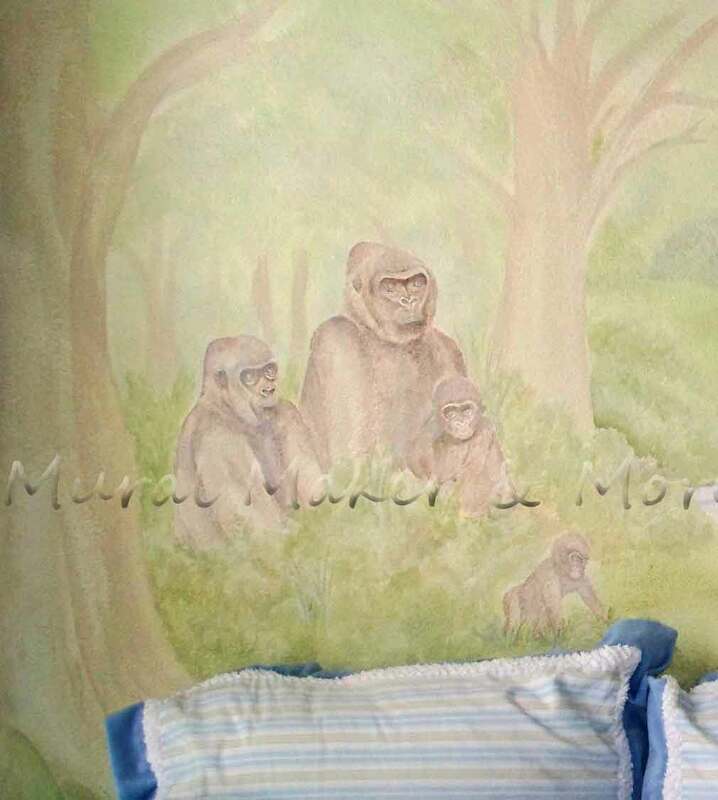 I would have never thought of putting gorillas in a baby mural, but they look cute in the muted tones, dontcha think? This elephant family is only about 2” tall. 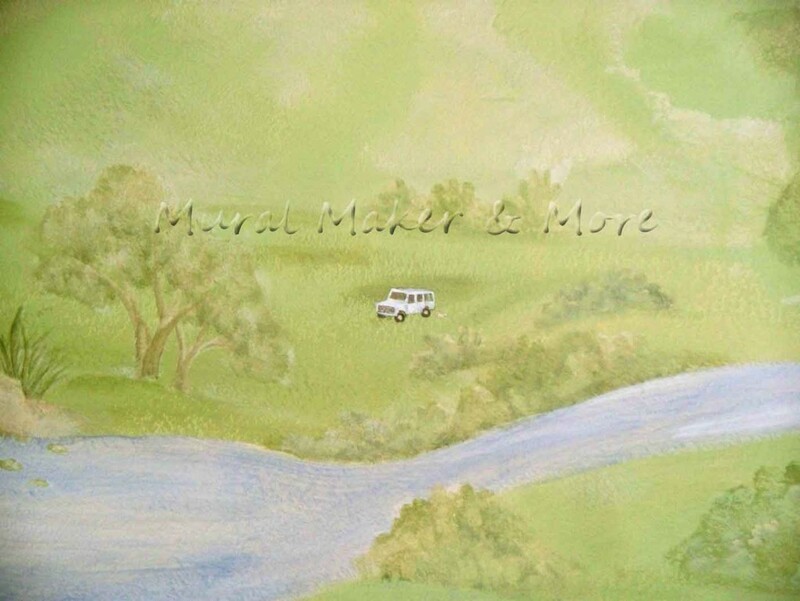 And the jeep is even smaller! These guys are much, much bigger. 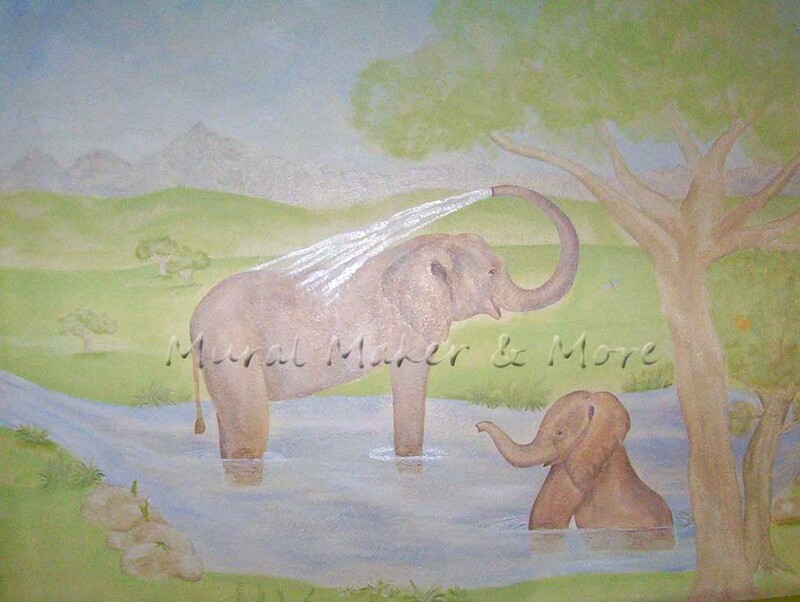 Check out the momma elephant’s spray. I used glitter paint and it actually glows when the light hits it. Look closely – under the 2 trees. It’s a zebra family. Yes, they’re tiny, too. I had forgotten how many animals I painted in this nursery mural. This was an afterthought of the clients’, but it makes the room. 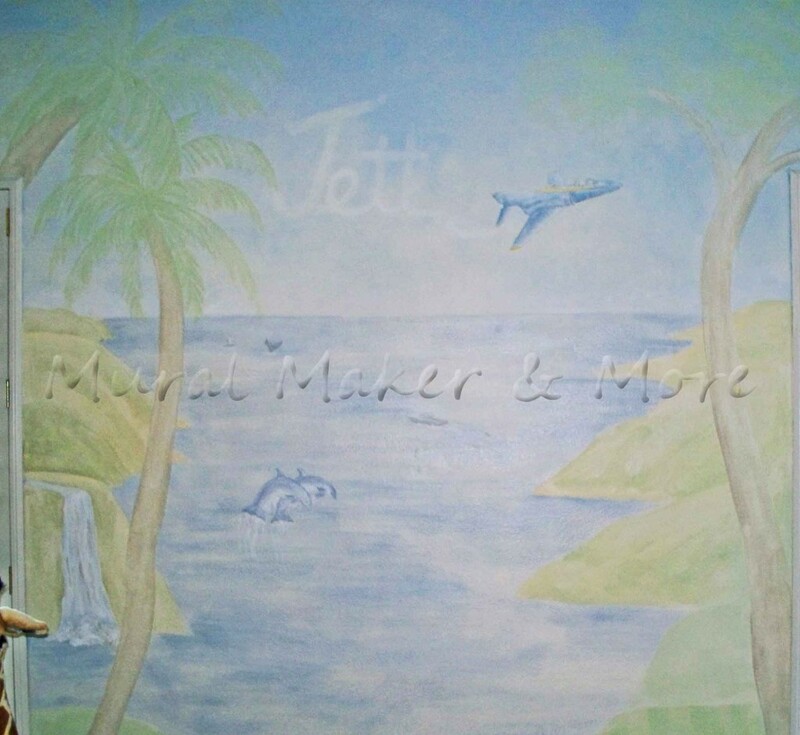 We personalized the mural with Jett’s name written in the airstream of the jet. We weren’t sure because they hadn’t decided fully on his name at the time. 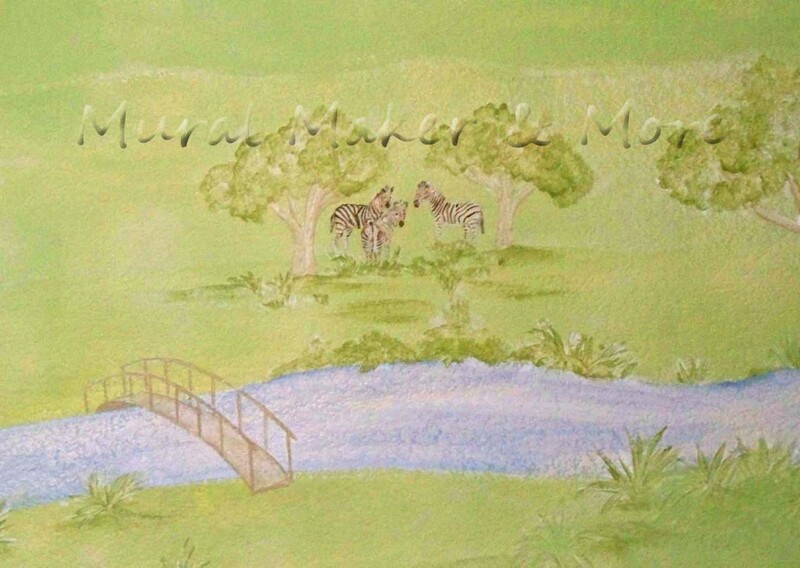 But now – 2 yrs later – his mural is personalized. They wanted an ocean scene, even though it’s a jungle mural. 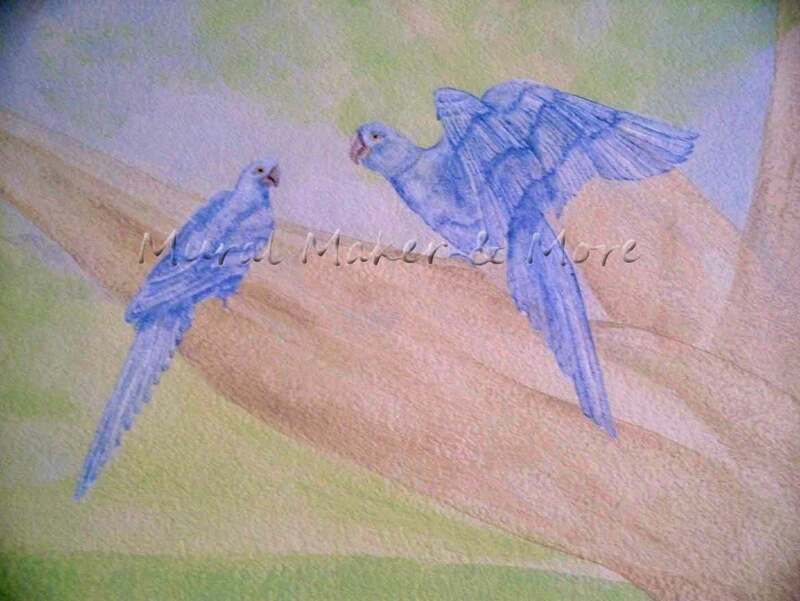 But that’s the fun of a custom painting – you can have what you want! I put their speed boat in, a whale, and two dolphins. 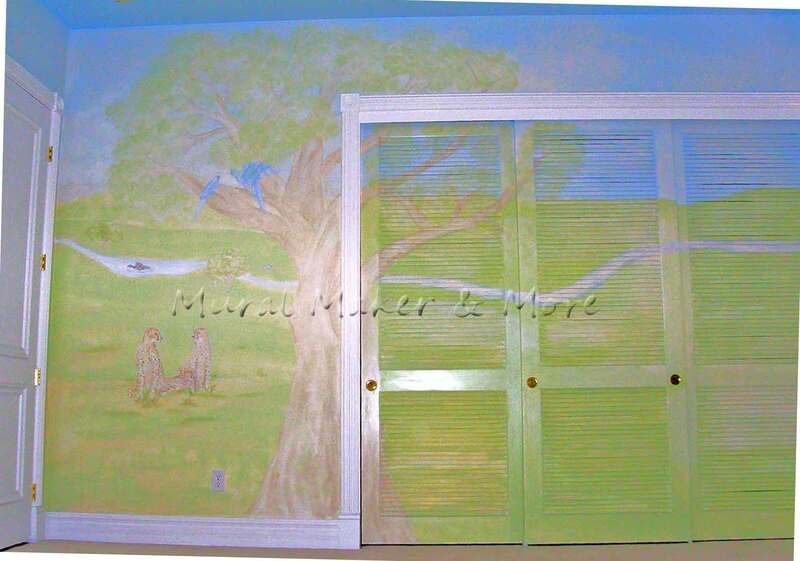 And those blasted wonderful louvered closet doors. So glad we didn’t leave them stark white. The dresser I refinished started out as an old cabinet from the grandmother’s home. Then it was a changing table. Now, just a dresser with stars on the knobs. 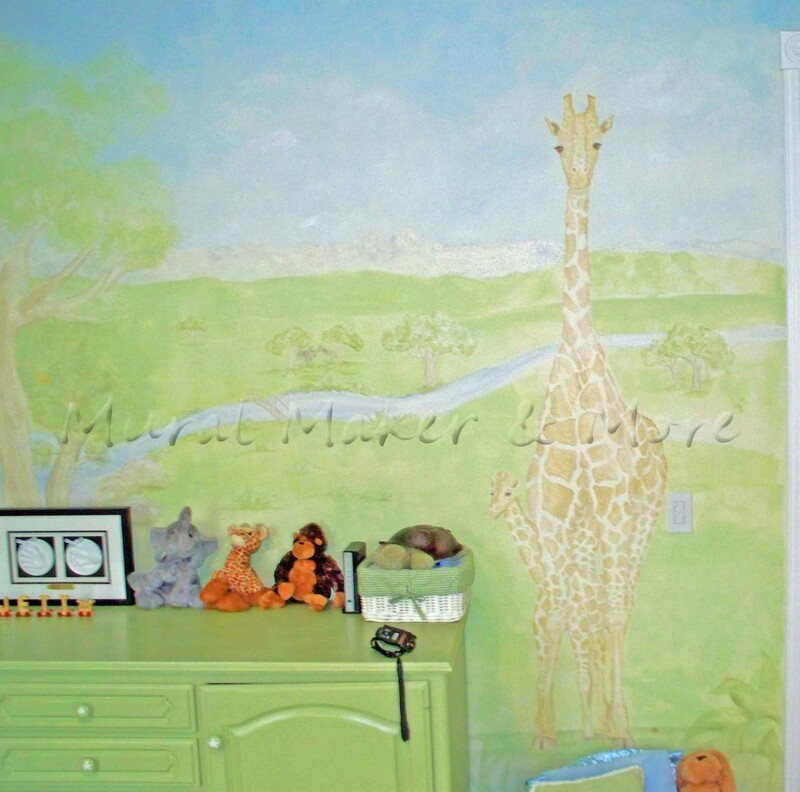 Momma & baby giraffe painted in between the door and the dresser. Behind the door sits a cheetah family. 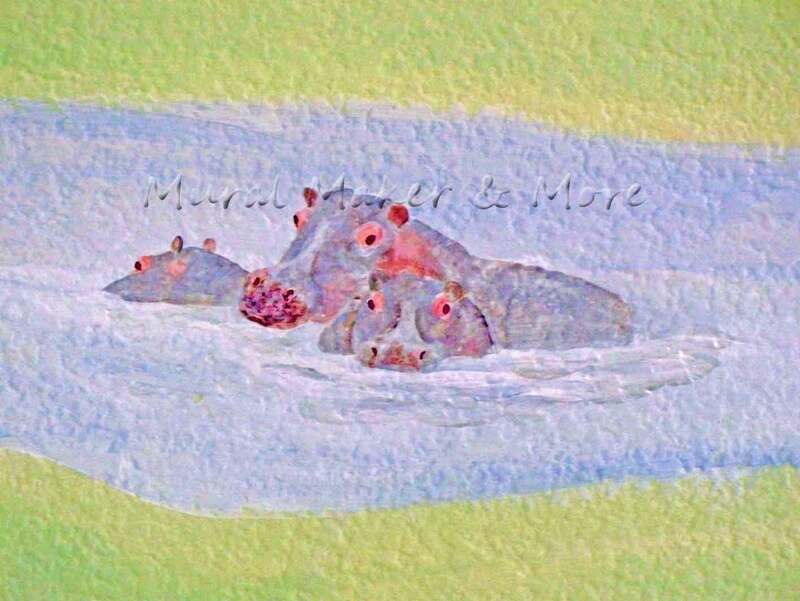 Above the cheetahs, a hippo family! 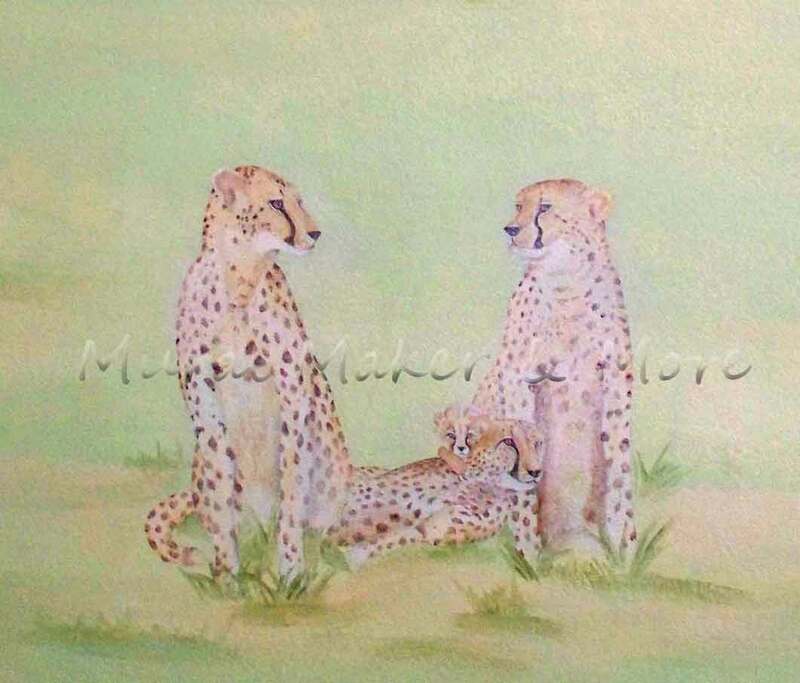 And above the cheetahs and hippos are my favorite. The blue parrots. Thanks for taking the tour of the baby boy’s mural with me. I’m still waiting for the video of the TV show. I’ll post it as soon as I get it. That is absolutely beautiful! You have done a wonderful job!! Just stopping by via SITS. How beautiful is that. What a lucky baby! 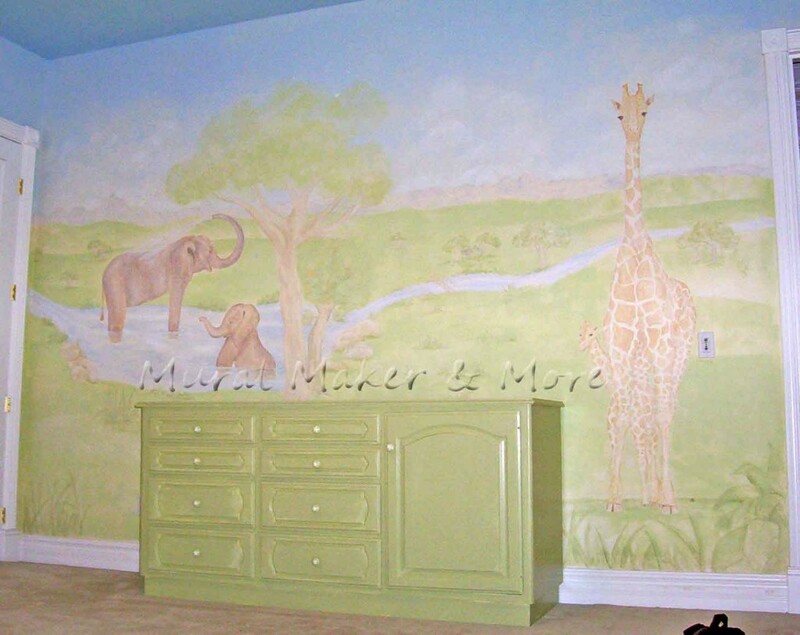 I did a jungle theme for our nursery. You are very talented! Very cute…that will take the kid through many years. My son is 7 and he would still like that. Oh boy ~ such talent. I couldn’t draw a straight line with a ruler. I love it when people can use their abilities and enjoyment of their creations to make a living. Good for you! !